Over £3 million raised… and counting! 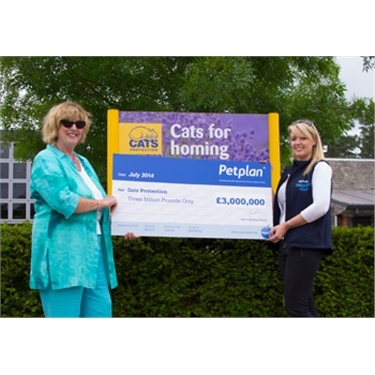 Cats Protection has been in partnership with pet insurance providers, Petplan, since 2001 and we are thrilled to announce that through this partnership over £3 million has been raised for the charity! Whenever a Cats Protection adopter or supporter takes out a full Petplan insurance policy for their pet, Petplan gives 10 per cent of the premium back to Cats Protection, and a further 10 per cent each year the policy is renewed. We celebrated the £3 million target at our Summer Fun Day at the National Cat Adoption Centre in July. Our friends from Petplan attended the event and we were able to celebrate the money raised as well as the work that Cats Protection has been able to do for cats throughout the UK. An important part of Petplan’s ethos is responsible pet ownership, a value which everyone at Cats Protection shares and supports. Through our partnership we are able to provide all of our rehomed cats with four weeks’ free Petplan insurance. This provides adopters with the peace of mind that they will be covered if their cat unexpectedly falls ill or is injured during their first few weeks settling into their new homes. Huge thanks must go to Petplan and each of our supporters who have taken out a Petplan policy. The valuable funds raised through this partnership have enabled us to care for and rehome more and more cats over the years.